I’ve done patches of work on this topic frequently over the last 20 years. It usually features in my books at some point too, but it’s always good to look afresh at anything. Sometimes you see something you didn’t see last time. Some of the potential future is pretty obvious. I use the word potential, because there are usually choices to be made, regulations that may or may not get in the way, or many other reasons we could divert from the main road or even get blocked completely. We’ve been learning genetics now for a long time, with a few key breakthroughs. It is certain that our understanding will increase, less certain how far people will be permitted to exploit the potential here in any given time frame. But let’s take a good example to learn a key message first. In IVF, we can filter out embryos that have the ‘wrong’ genes, and use their sibling embryos instead. Few people have a problem with that. At the same time, pregnant women may choose an abortion if they don’t want a child when they discover it is the wrong gender, but in the UK at least, that is illegal. The moral and ethical values of our society are on a random walk though, changing direction frequently. The social assignment of right and wrong can reverse completely in just 30 years. In this example, we saw a complete reversal of attitudes to abortion itself within 30 years, so who is to say we won’t see reversal on the attitude to abortion due to gender? It is unwise to expect that future generations will have the same value sets. In fact, it is highly unlikely that they will. That lesson likely applies to many technology developments and quite a lot of social ones – such as euthanasia and assisted suicide, both already well into their attitude reversal. At some point, even if something is distasteful to current attitudes, it is pretty likely to be legalized eventually, and hard to ban once the door is opened. There will always be another special case that opens the door a little further. So we should assume that we may eventually use genetics to its full capability, even if it is temporarily blocked for a few decades along the way. The same goes for other biotech, nanotech, IT, AI and any other transhuman enhancements that might come down the road. So, where can we go in the future? 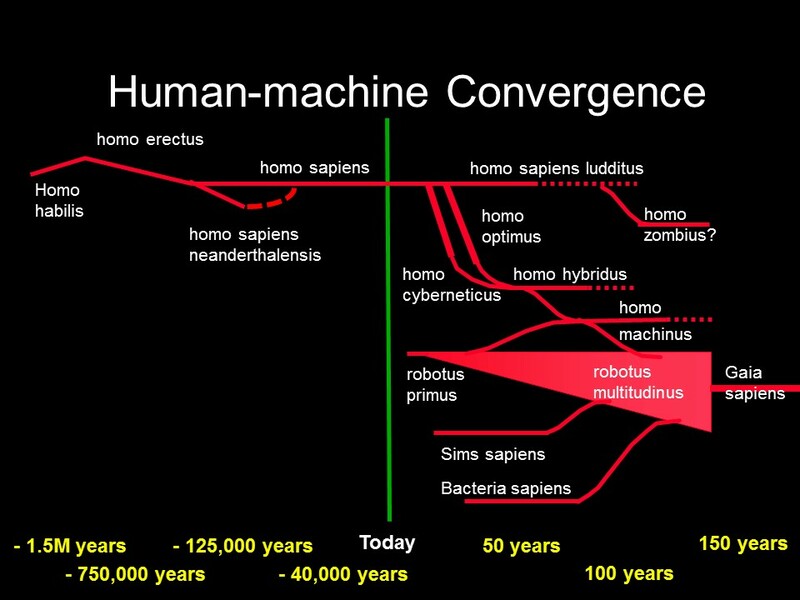 What sorts of splits can we expect in the future human evolution path? It certainly won’t remain as just plain old homo sapiens. It was clear even then that we could connect external IT to the nervous system, eventually the brain, and this would lead to IT-enhanced senses, memory, processing, higher intelligence, hence homo cyberneticus. (No point in having had to suffer Latin at school if you aren’t allowed to get your own back on it later). 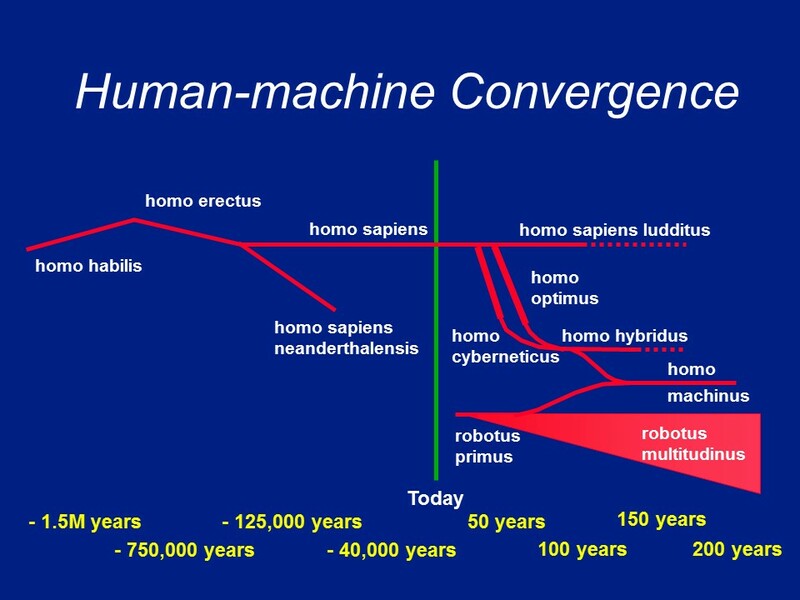 Meanwhile, genetic enhancement and optimization of selected features would lead to homo optimus. Converging these two – why should you have to choose, why not have a perfect body and an enhanced mind? – you get homo hybridus. Meanwhile, in the robots and AI world, machine intelligence is increasing and we eventually we get the first self-aware AI/robot (it makes little sense to separate the two since networked AI can easily be connected to a machine such as a robot) and this has its own evolution path towards a rich diversity of different kinds of AI and robots, robotus multitudinus. Since both the AI world and the human world could be networked to the same network, it is then easy to see how they could converge, to give homo machinus. This future transhuman would have any of the abilities of humans and machines at its disposal. and eventually the ability to network minds into a shared consciousness. A lot of ordinary conventional humans would remain, but with safe upgrades available, I called them homo sapiens ludditus. As they watch their neighbors getting all the best jobs, winning at all the sports, buying everything, and getting the hottest dates too, many would be tempted to accept the upgrades and homo sapiens might gradually fizzle out. I realized that we could still add AI into computer games long after it becomes comparable with human intelligence, so games like EA’s The Sims might evolve to allow entire civilizations living within a computer game, each aware of their existence, each running just as real a life as you and I. It is perhaps unlikely that we would allow children any time soon to control fully sentient people within a computer game, acting as some sort of a god to them, but who knows, future people will argue that they’re not really real people so it’s OK. Anyway, you could employ them in the game to do real knowledge work, and make money, like slaves. But since you’re nice, you might do an incentive program for them that lets them buy their freedom if they do well, letting them migrate into an android. They could even carry on living in their Sims home and still wander round in our world too. Emigration from computer games into our world could be high, but the reverse is also possible. If the mind is connected well enough, and enhanced so far by external IT that almost all of it runs on the IT instead of in the brain, then when your body dies, your mind would carry on living. It could live in any world, real or fantasy, or move freely between them. (As I explained in my last blog, it would also be able to travel in time, subject to certain very expensive infrastructural requirements.) As well as migrants coming via electronic immortality route, it would be likely that some people that are unhappy in the real world might prefer to end it all and migrate their minds into a virtual world where they might be happy. As an alternative to suicide, I can imagine that would be a popular route. If they feel better later, they could even come back, using an android. So we’d have an interesting future with lots of variants of people, AI and computer game and fantasy characters migrating among various real and imaginary worlds. But it doesn’t stop there. Meanwhile, back in the biotech labs, progress is continuing to harness bacteria to make components of electronic circuits (after which the bacteria are dissolved to leave the electronics). Bacteria can also have genes added to emit light or electrical signals. They could later be enhanced so that as well as being able to fabricate electronic components, they could power them too. We might add various other features too, but eventually, we’re likely to end up with bacteria that contain electronics and can connect to other bacteria nearby that contain other electronics to make sophisticated circuits. We could obviously harness self-assembly and self-organisation, which are also progressing nicely. The result is that we will get smart bacteria, collectively making sophisticated, intelligent, conscious entities of a wide variety, with lots of sensory capability distributed over a wide range. Bacteria Sapiens. I often talk about smart yogurt using such an approach as a key future computing solution. If it were to stay in a yogurt pot, it would be easy to control. But it won’t. A collective bacterial intelligence such as this could gain a global presence, and could exist in land, sea and air, maybe even in space. Allowing lots of different biological properties could allow colonization of every niche. In fact, the first few generations of bacteria sapiens might be smart enough to design their own offspring. They could probably buy or gain access to equipment to fabricate them and release them to multiply. It might be impossible for humans to stop this once it gets to a certain point. Accidents happen, as do rogue regimes, terrorism and general mad-scientist type mischief. And meanwhile, we’ll also be modifying nature. We’ll be genetically enhancing a wide range of organisms, bringing some back from extinction, creating new ones, adding new features, changing even some of the basic mechanism by which nature works in some cases. We might even create new kinds of DNA or develop substitutes with enhanced capability. We may change nature’s evolution hugely. With a mix of old and new and modified, nature evolves nicely into Gaia Sapiens. Just one thing is added. Homo zombius. I realized eventually that the sci-fi ideas of zombies being created by viruses could be entirely feasible. A few viruses, bacteria and other parasites can affect the brains of the victims and change their behaviour to harness them for their own life cycle. Bacteria sapiens could be highly versatile. It could make virus variants if need be. It could evolve itself to be able to live in our bodies, maybe penetrate our brains. Bacteria sapiens could make tiny components that connect to brain cells and intercept signals within our brains, or put signals back in. It could read our thoughts, and then control our thoughts. It could essentially convert people into remote controlled robots, or zombies as we usually call them. They could even control muscles directly to a point, so even if the zombie is decapitated, it could carry on for a short while. I used that as part of my storyline in Space Anchor. If future humans have widespread availability of cordless electricity, as they might, then it is far fetched but possible that headless zombies could wander around for ages, using the bacterial sensors to navigate. Homo zombius would be mankind enslaved by bacteria. Hopefully just a few people, but it could be everyone if we lose the battle. Think how difficult a war against bacteria would be, especially if they can penetrate anyone’s brain and intercept thoughts. The Terminator films looks a lot less scary when you compare the Terminator with the real potential of smart yogurt. 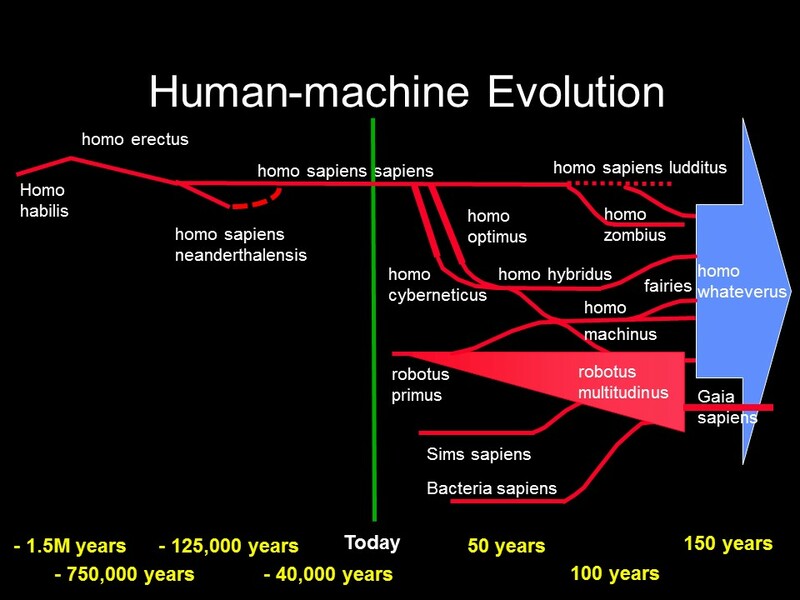 Bacteria sapiens might also need to be consulted when humans plan any transhuman upgrades. If they don’t consent, we might not be able to do other transhuman stuff. Transhumans might only be possible if transbacteria allow it. Not done yet. I wrote a couple of weeks ago about fairies. I suggested fairies are entirely feasible future variants that would be ideally suited to space travel. They’d also have lots of environmental advantages as well as most other things from the transhuman library. So I think they’re inevitable. So we should add fairies to the future timeline. We need a revised timeline and they certainly deserve their own branch. But I haven’t drawn it yet, hence this blog as an excuse. Before I do and finish this, what else needs to go on it? What else? OK, well there is a very significant community (many millions of people) that engages in all sorts of fantasy in shared on-line worlds, chat rooms and other forums. Fairies, elves, assorted spirits, assorted gods, dwarves, vampires, werewolves, assorted furry animals, assorted aliens, dolls, living statues, mannequins, remote controlled people, assorted inanimate but living objects, plants and of course assorted robot/android variants are just some of those that already exist in principle; I’m sure I’ve forgotten some here and anyway, many more are invented every year so an exhaustive list would quickly become out of date. In most cases, many people already role play these with a great deal of conviction and imagination, not just in standalone games, but in communities, with rich cultures, back-stories and story-lines. So we know there is a strong demand, so we’re only waiting for their implementation once technology catches up, and it certainly will. Biotech can do a lot, and nanotech and IT can add greatly to that. If you can design any kind of body with almost any kind of properties and constraints and abilities, and add any kind of IT and sensing and networking and sharing and external links for control and access and duplication, we will have an extremely rich diversity of future forms with an infinite variety of subcultures, cross-fertilization, migration and transformation. In fact, I can’t add just a few branches to my timeline. I need millions. So instead I will just lump all these extras into a huge collected category that allows almost anything, called Homo Whateverus. I won’t be around to watch it all happen. But a lot of you will. Dr Who should have written this but he didn’t so I have to. We keep seeing those cute little tears in space-time in episodes of the BBC’s Dr Who, that let through Daleks and Cybermen and other nasties. (As an aside, how come feminists never seem to object to the term Cybermen, even though 50% of them are made from women?). Dr Who calls them rifts, and it allegedly needs the energy of entire star systems to open and close them. So, not much use as a weapon then, but still a security issue if our universe leaks. I just wrote about time travel again. All competent physicists rightly switch on their idiot filters automatically on hearing any of the terms ‘cold fusion’, ‘telekinetic’, ‘psychic’, ‘perpetual motion machine’, ‘time travel’ or ‘global warming catastrophe’. Sorry, that last one just sort of crept in there. Time travel is not really possible, unless you’re inside a black hole or you’re talking about a particle shifting atoseconds in a huge accelerator or GPS relativistic corrections or something. A Tardis isn’t going to be here any time soon and may be impossible and never ever come. However, there is a quite real cyberspace route to quite real time travel that will become feasible around 2075, a virtual rift if you like, but no need to activate idiot filters just yet, it’s only a virtual rift, a rift in a sandbox effectively, and it won’t cause the universe to collapse or violate any known laws of physics. So, hit the temporary override button on your idiot filter. It’s a fun thought experiment that gets more and more fun the more you look at it. (Einstein invented thought experiments to investigate relativity, because he couldn’t do any real experiments with the technology of his time. We can’t verify this sort of time travel experimentally yet so thought experiment is the only mechanism available. Sadly, I don’t have Einstein’s brain to hand, but some aspects at least are open to the rest of us to explore.) The hypothesis here is that if you can make a platform that stores the state of all the minds in a system continuously over a period from A to B, and that runs all those minds continuously using a single editable record, then you can travel in time freely between A and B. Now we need to think it through a bit to test the hypothesis and see what virtual physics we can learn from it, see how real it would be and what it would need and lead to. that cyberspace offers a time travel cheat. 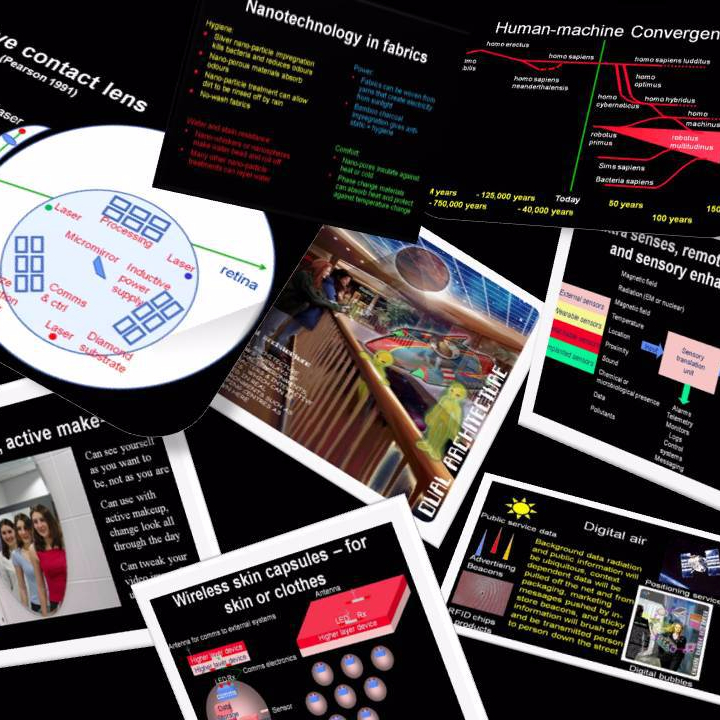 The basic idea, to save you reading it now that it’s out of date, is that some time soon after 2050 – let’s take 2075 as the date that crowd-funding enables its implementation – we’ll all be able to connect our brains so well to the machine world that it will be possible to share thoughts and consciousness, sensations, effectively share bodies, live electronically until all the machines stop working, store your mind as a snapshot periodically in case you want to restore to an earlier backup and do all sorts of really fun things like swapping personalities. (You can see why it might attract the required funding so might well become real). If that recording of your mind is complete enough, and it could be, then, you really could go back to an earlier state of yourself. More importantly, a future time tourist could access all the stored records and create an instance of your mind and chat to you and chat and interact with you from the future. This would allow future historians to do history better. Well, that’s the basic version. Our thought experiment version needs to go a bit further than that. Let’s call it the deluxe version. If you implement the deluxe version, then minds run almost entirely on the machine world platform, and are hosted there with frequent restore points. The current state of the system is an interactive result of real-time running of all the minds held in cyberspace across the whole stored timeline. For those minds running on the deluxe version platform, there isn’t any other reality. That’s what makes up those future humans and AIs on it. Once you join the system, you can enjoy all of the benefits above and many more. You could actually change old records and use the machines to ripple the full system-wide consequences all the way through the timeline to whenever your future today is. It would allow you to go back to visit your former self and do some editing, wouldn’t it? And in this deluxe version, the edits you make would ripple through into your later self. That’s what you get when you migrate the human mind from the Mk1 human brain platform into the machine world platform. It becomes endlessly replicable and editable. In this deluxe version, the future world really could be altered by editing the past. You may reasonably ask why we would allow any moron to allow that to be built, but that won’t affect the theoretical ability to travel in time through cyberspace. It is very easy to see how such a system allows you to chat with someone in the past. What is less obvious, and what my excuse for a brain missed first time round, is that it also lets you travel forwards in time. How, you may reasonably ask, can you access and edit records that don’t exist yet? Well, think of it from the other direction. Someone in the future can restore any previous instance of you from any time point and talk to them, even edit them. They could do that all in some sort of time-play sandbox to save money and avoid quite a few social issues, or they could restore you fully to their time, and since the reality is just real-time emulation all rippled through nicely by the machine platform, you would suddenly appear in the future and become part of that future world. You could wander around in a future android body and do physical things in that future physical world just as if you’d always lived there. Your future self would feel they have travelled in time. But a key factor here is that it could be your future self that makes it happen. You could make a request in 2075 to your future self to bring you to the future in 2150. When 2150 arrives, you see (or might even remember) the request, you go into the archives, and you restore your old 2075 self to 2150, then you instruct deletion of all the records between 2075 and 2150 and then you push the big red button. The system runs all the changes and effects through the timeline, and the result is that you disappear in 2075, and suddenly reappear in 2150. There would be backups of the alternative timeline, but the official and effective system reality would be that you travelled from 2075 to 2150. That will be the reality running on the deluxe system. Any other realities are just backups and records on a database. Now,so far it’s a one way trip, far better if you can have a quick trip to the future and come back. So, you’re in 2150, suppose you want to go back again. You’ve been around a while and don’t like the new music or the food or something. So before you go, you do the usual time mischief. You collect lots of really useful data about how all the latest tech works, buy the almanacs of who wins what, just like in Back to the Future, just in case the system has bugs that let you use them, and you tweak the dials again. You set the destination to 2075 and hit the big red button. The system writes your new future-wise self over your original 2075 entry, keeping a suitable backup of course. The entry used by the deluxe system is whatever is written in its working record, and that is the you that went to 2150 and back. Any other realities are just backups. So, the system ripples it all through the timeline. You start the day in 2075, have a quick trip for a week’s holiday in 2150, and then return a few minutes later. Your 2075 self will have experienced a trip to 2150 and come back, complete with all the useful data about the 2150 world. If you don’t mess with anything else, you will remember that trip until 2150, at which time you’ll grab a few friends and chat about the first time you ever did time travel. All of the above is feasible theoretically, and none of it violates any known physics. The universe won’t collapse in a causality paradox bubble rift if you do it, no need to send for Dr Who. That doesn’t mean it isn’t without issues. It still creates a lot of the time travel issues we are so familiar with from sci-fi. But this one isn’t sci-fi – we could build it, and we could get the crowd-funding to make it real by 2075. Don’t get too excited yet though. You could have gone further into the future than 2150 too, but there is a limit. You can only go as far as there exists a continuous record from where you are. You basically need a road that goes all the way there. If some future authority bans time travel or changes to an incompatible system, that represents a wall you can’t pass through. An even later authority could only remove that wall under certain circumstances, and only if they have the complete records, and the earlier authority might have stopped storing them or even deleted earlier ones and that would ruin any chances of doing it properly. So, having established that it is possible, we have to ask the more serious question: how real is this time travel? Is it just a cyberspace trick with no impact on the real world? Well, in this scenario, your 2075 mind runs on the deluxe system using its 2075 record. But which one, the old one or the edited one? The edited one of course. The old version is overwritten and ceases to exist except as a backup. There remains no reality except the one you did your time travel trip in. Your time trip is real. But let’s ask a few choice questions, because reality can turn out to be just an illusion sometimes. So, when you get home to 2075, you can print off your 2150 almanac and brag about all the new technologies you just invented from 2150. Yes? Yes… if you implement the deluxe version. Is there a causality paradox? But you just short-circuited technology development from 2075 to 2150? So you can do real time travel from 2075? You’ll suddenly vanish from 2075, spend some time in 2150, and later reappear in 2075? Yes, if you implement the deluxe version. Well, what happens in 2150? You’ll do all the pushing red button stuff and have a party with your friends to remember your first time trip. If you set the times right, you could even invite your old self from 2075 as a guest and wave goodbye as you* goes back to 2075. Or you* could stay in 2150 and there’d be two of you from then on? OK, this sounds great fun. So when can we build this super-duper deluxe version that let’s you time travel from 2075 to 2150 and go back again. And what happens to me between 2075 and 2150 while I wait for it to be built? Well, you invest in the deluxe version, connect into the system, and it starts recording all its subscribers’ minds from then on, and you carry on enjoying life until 2150 arrives. Then you can travel from 2075 to 2150, retrospectively. Well, you can travel from 2075 to whatever date in the future the deluxe system still exists. And your 2075 self will fully experience it as time travel. It won’t feel retrospective. But you have to wait till that date before you can go there? Yes. But you won’t remember having to wait, all the records of that will be wiped, you’ll just vanish in 2075 and reappear in 2150 or whenever. What *insert string of chosen expletives here* use is that? Erm…. Well…. You will still have enjoyed a nice life from 2075 to 2150 before it’s deleted and replaced. But I won’t remember that will I? No. But you won’t remember it when you’re dead either. So I can only do this sort of time travel by having myself wiped off the system for all the years in between after I’ve done it? So the best way of doing that is not to bother with all the effort of living through all those years since they’re going to be deleted anyway and save all the memory and processing by just hibernation in the archives till that date arrives? So I’ll really vanish in 2075 and be restored in 2150 and feel it as time travel? And there won’t be any messy database records to clean up in between, and it will all be nice and environmentally friendly? And not having to run all those people years that would later be deleted will reduce storage and processing costs and system implementation costs dramatically? OK, sounds a bit better again. But it’s still a fancy cyberspace hibernation scheme really isn’t it? Well, you can travel back and forth through time as much as you like and socialize with anyone from any time zone and live in any time period. Some people from 2150 might prefer to live in 2075 and some from 2075 prefer to live in 2150. Everyone can choose when they live or just roam freely through the entire time period. A bit like that episode of Star Trek TOS where they all got sent through a portal to different places and times and mixed with societies made of others who had come the same way. You could do that. A bit like a glorified highly immersive computer game. But what about gambling and using almanacs from the future? And inventing stuff in 2075 that isn’t really invented till 2150? All the knowledge and data from 2150 will be there in the 2075 system so you won’t have anything new and gambling won’t be a viable industry. But it won’t be actually there until 2150. So the 2075 database will be a retrospective singularity where all of the future knowledge suddenly appears. Isn’t that a rift in the time-space continuum, letting all the future weapons and political activists and terrorists and their plans through from 2150 to 2075? And Daleks? Some idiot will build one just for the hell of it. They’ll come through the rift too won’t they. And Cyberpersons? It will not be without technical difficulties. And anyway, they can’t do any actual damage outside the system. But these minds running in the system will be connected to android bodies or humans outside it. Their minds can time travel through cyberspace. Can’t they do anything nasty? No, they can only send their minds back and connect to stuff within the system. Any androids and bodies could only be inhabited by first generation minds that belong to that physical time. They can only make use of androids or other body sharing stuff when they travel forwards through time, because it is their chosen future date where the android lives and they can arrange that. On a journey backwards, they can only change stuff running in the system. And that’s what stops it violating physics? So let’s get this straight. This whole thing is great for extending your mind into cyberspace, sharing bodies, swapping personalities, changing gender or age, sharing consciousness and some other things. But time travel is only possible for your mind that is supported exclusively in the system. And only that bit in the system can time travel. And your actual 2075 body can’t feel the effect at all or do anything about it? So it’s really another you that this all happens to and you start diverging from your other cyber-self the moment you connect. A replica of you enjoys all the benefits but it thinks it is you and feels like you and essentially is you, but not in the real world. And the original you carries on in parallel. Correct. It is a big cyberspace bubble created over time with continuous timeline emulation, that only lets you time travel and interact within the bubble. Like an alternative universe, and you can travel in time in it. But it can only interact with the physical universe in real time at the furthermost frontier of the bubble. A frontier that moves into the future at the same speed as the rest of the local space-time continuum and doesn’t cause any physics problems or real time paradoxes outside of the system. So it’s not REAL time travel. It’s just a sort of cyber-sandbox, albeit one that will be good fun and still worth building. You can time travel in the parallel universe that you make in cyberspace. But it will be real within that universe. Forwards physical time travel is additionally possible in the physical universe if you migrate your mind totally into cyberspace, e.g. when you die, so you can live electronically, and even then it is really just a fancy form of hibernation. And if you travel back in time in the system, you won’t be able to interact with the physical stuff in the past, only what is running on the system. As long as you accept those limitations, you can travel in time after 2075 and live in any period supported after that. Why do all the good things only ever happen in another universe? No physics or mathematics has knowingly been harmed during this thought experiment. No responsibility is accepted for any time-space rifts created as a result of analytical error. It is very risky naming the final frontier. A frontier is just the far edge of where we’ve got to. Technology has a habit of opening new doors to new frontiers so it is a fast way of losing face. When Star Trek named space as the final frontier, it was thought to be so. We’d go off into space and keep discovering new worlds, new civilizations, long after we’ve mapped the ocean floor. Space will keep us busy for a while. In thousands of years we may have gone beyond even our own galaxy if we’ve developed faster than light travel somehow, but that just takes us to more space. It’s big, and maybe we’ll never ever get to explore all of it, but it is just a physical space with physical things in it. We can imagine more than just physical things. That means there is stuff to explore beyond space, so space isn’t the final frontier. So… not space. Not black holes or other galaxies. Certainly not the ocean floor, however fashionable that might be to claim. We’ll have mapped that in details long before the rest of space. Not the centre of the Earth, for the same reason. How about cyberspace? Cyberspace physically includes all the memory in all our computers, but also the imaginary spaces that are represented in it. The entire physical universe could be simulated as just a tiny bit of cyberspace, since it only needs to be rendered when someone looks at it. All the computer game environments and virtual shops are part of it too. The cyberspace tree doesn’t have to make a sound unless someone is there to hear it, but it could. The memory in computers is limited, but the cyberspace limits come from imagination of those building or exploring it. It is sort of infinite, but really its outer limits are just a function of our minds. Games? Dreams? Human Imagination? Love? All very new agey and sickly sweet, but no. Just like cyberspace, these are also all just different products of the human mind, so all of these can be replaced by ‘the human mind’ as a frontier. I’m still not convinced that is the final one though. Even if we extend that to greatly AI-enhanced future human mind, it still won’t be the final frontier. When we AI-enhance ourselves, and connect to the smart AIs too, we have a sort of global consciousness, linking everyone’s minds together as far as each allows. That’s a bigger frontier, since the individual minds and AIs add up to more cooperative capability than they can achieve individually. The frontier is getting bigger and more interesting. You could explore other people directly, share and meld with them. Fun, but still not the final frontier. So, time travel in fully networked fully AI-enhanced cosmically-connected cyberspace/dream-space/imagination/love/games would be a bigger and later frontier. It lets you travel far into the future and so it notionally includes any frontiers invented and included by then. Is it the final one though? Well, there could be some frontiers discovered after the time travel windows are closed. They’d be even finaller, so I won’t bet on it. I wrote You Tomorrow two years ago. It was my first ebook, and pulled together a lot of material I’d written on the general future of life, with some gaps then filled in. I was quite happy with it as a book, but I could see I’d allowed quite a few typos to get into the final work, and a few other errors too. However, two years is a long time, and I’ve thought about a lot of new areas in that time. So I decided a few months ago to do a second edition. I deleted a bit, rearranged it, and then added quite a lot. I also wrote the partner book, Total Sustainability. 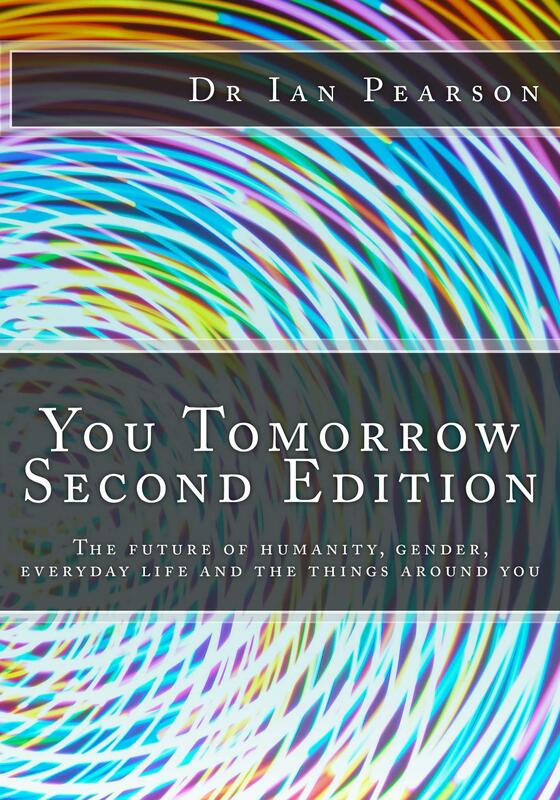 It includes a lot of my ideas on future business and capitalism, politics and society that don’t really belong in You Tomorrow. Time travel comes up frequently in science fiction, and some physicists think it might be theoretically possible, to some degree, within major constraints, at vast expense, between times that are in different universes. Frankly, my physics is rusty and I don’t have any useful contribution to make on how we might do physical time travel, nor on its potential. However, intelligence available to us to figure the full physics out will accelerate dramatically thanks to the artificial intelligence positive feedback loop (smarter machines can build even smarter ones even faster) and some time later this century we will definitely work out once and for all whether it is doable in real life and how to do it. And we’ll know why we never meet time tourists. If it can be done and done reasonable economically and safely, then it will just be a matter of time to build it after that. Well, stuff that! Not interested in waiting! If the laws of physics make it so hard that it may never happen and certainly not till at least towards the end of this century, even if it is possible, then let’s bypass the laws of physics. Engineers do that all the time. If you are faced with an infinitely tall impenetrable barrier so you can’t go over it or through it, then check whether the barrier is also very wide, because there may well be an easy route past the barrier that doesn’t require you to go that way. I can’t walk over tall buildings, but I still haven’t found one I couldn’t walk past on the street. There is usually a way past barriers. And with time travel, that turns out to be the case. There is an easy route past. Physics only controls the physical world. Although physics certain governs the technologies we use to create cyberspace, it doesn’t really limit what you can do in cyberspace any more than in a dream, a costume drama, or a memory. Cyberspace takes many forms, it is’t homogeneous or even continuous. It has many dimensions. It can be quite alien. But in some areas, such as websites, archives are kept and you can look at how a site was in the past. Extend that to social networking and a problem immediately appears. How can you communicate or interact with someone if the site you are on is just an historical snapshot and isn’t live? How could you go back and actually chat to someone or play a game against them? The solution to this problem is a tricky technological one but it is entirely possible, and it won’t violate any physics. If you want to go back in time and interact with people as they were, then all you need is to have an archive of those people. Difficult, but possible. In cyberspace. Around 2050, we should be starting to do direct brain links, at least in the lab and maybe a bit further. Not just connections to the optic nerve or inner ear, or chips to control wheelchairs, we already have that. And we already have basic thought recognition. By 2050 we will be starting to do full links, that allow thoughts to pass both ways between man and machine, so that the machine world is effectively an extension of your brain. As people’s thoughts, memories and even sensations become more cyberspace based, as they will, the physical body will become less relevant. (Some of my previous blogs have considered the implication of this for immortality). Once stuff is in the IT world, it can be copied, and backed up. That gives us the potential to make recordings of people’s entire lives, and capable of effectively replicating them at will. Today we have web archives that try to do that with web sites so you can access material on older versions of them. Tomorrow we’ll also be able to include people in that. Virtually replicating the buildings and other stuff would be pretty trivial by comparison. In that world, it will be possible for your mind, which is itself an almost entirely online entity, to interact with historic populations, essentially to time travel. Right back to the date when they were started being backed up, some time after 2050. The people they would be dealing with would be the same actual people that existed then, exactly as they were, perfect copies. They would behave and respond exactly the same. So you could use this technique to time travel back to 2050 at the very best but no earlier. And for a proper experience it would be much later, say 2100. And then it starts to get interesting. In an electronic timeline such as that, the interactions you have with those people in the last would have two options. They could be just time tourism or social research, or other archaeology, which has no lasting effect, and any traces of your trip would vanish when you leave. Or they could be more effectual. The interactions you have when you visit could ripple all the way back through the timeline to your ‘present?’, or future? or was it the past when you were present in the future? (it is really hard to choose the right words tenses when you write about time travel!!). The computers could make it all real, running the entire society through its course, at a greatly accelerated speed. The interactions could therefore be quite real, and all the interactions and all the minds and the rippling social effects could all be implemented. But the possibilities branch again, because although that could be true, and the future society could be genuinely changed, that could also be done by entirely replicating the cyberworld, and implementing the effects only in the parallel new cyber-universe. Doing either of these effectual options might prove very expensive, and obviously dangerous. Replicating things can be done, but you need a lot of computer power and storage to do it with everything affected, so it might be severely restricted. And policed. But importantly, this sort of time travel could be done – you could go back in time to change the present. All the minds of all the people could be changed by someone going back in the past cyberspace records and doing something that would ripple forwards through time to change those same minds. It couldn’t be made fully clean, because some people for example might choose not to have kids in the revised edition, and although the cyberspace presence of their minds could be changed or deleted, you’d still have to dispose of their physical bodies and tidy up other physical residual effects. But not being clean is one of the things we’d expect for time travel. There would be residues, mess, paradoxes, and presumably this would all limit the things you’d be allowed to mess with. And we will need the time cops and time detectives and licenses and time cleaners and administrators and so on. But in our future cyberspace world, TIME TRAVEL WILL BE POSSIBLE. I can’t shout that loud enough. And please don’t ignore the italics, I am absolutely not suggesting it will be doable in the real world. Fun! Trouble is, I’m going to be 90 in 2050 so I probably won’t have the energy any more.